Heat grill. In medium bowl, combine ground beef, cheese, parsley, garlic salt and ground red pepper; mix gently until well blended. Shape mixture into 4 patties, 4 inches in diameter. When ready to grill, place patties on gas grill over medium heat or on charcoal grill 4 to 6 inches from medium coals. Cook 13 to 15 minutes or until thoroughly cooked, turning once. Meanwhile, brush onion slices with olive oil. Add to grill during last 5 to 8 minutes of cooking time for patties. Cook onion until tender, turning once. To toast buns, place cut sides down on grill during last 1 to 2 minutes of cooking time. 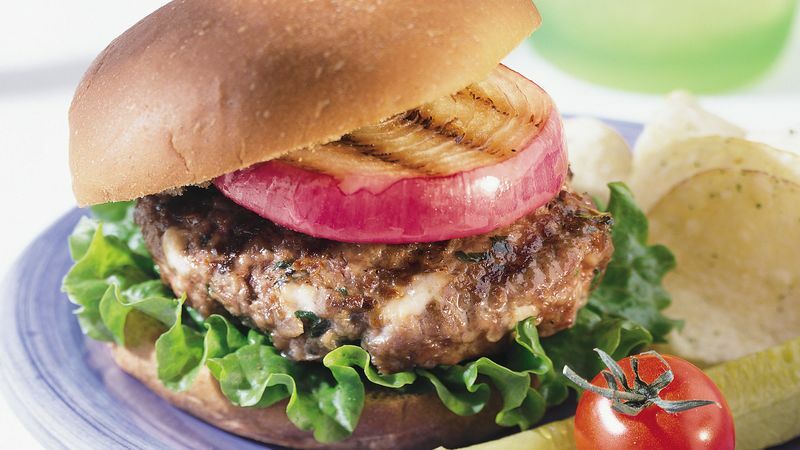 Place 1 onion slice on each patty on grill. Spread bottom half of each bun with mayonnaise; top with lettuce and onion-topped patty. Cover with top halves of buns.